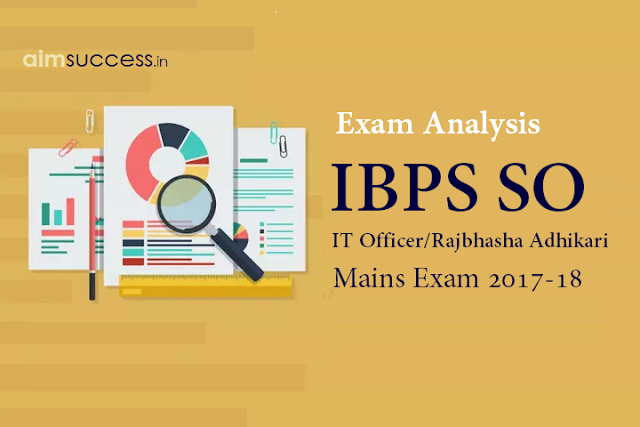 IBPS SO Main 2017-18 Recruitment Exam is over, Now it's time for the much awaited IBPS SO Mains Exam Analysis & Questions Asked 28th January 2018 for (IT Officer and Rajbhasha Adhikari). Many students have appeared for this exam today and this brings them to a step closer in their journey of getting a Job in govt. sector. Without wasting any moment, let's get straight to the analysis for which you are all waiting for. Keeping up with the trend of changing exam pattern, IBPS SO Mains was no exception. You can check the latest IBPS SO Mains Exam Pattern. Overall the exam was Easy-Moderate Level for both IT Officer & Rajbhasha Adhikari. 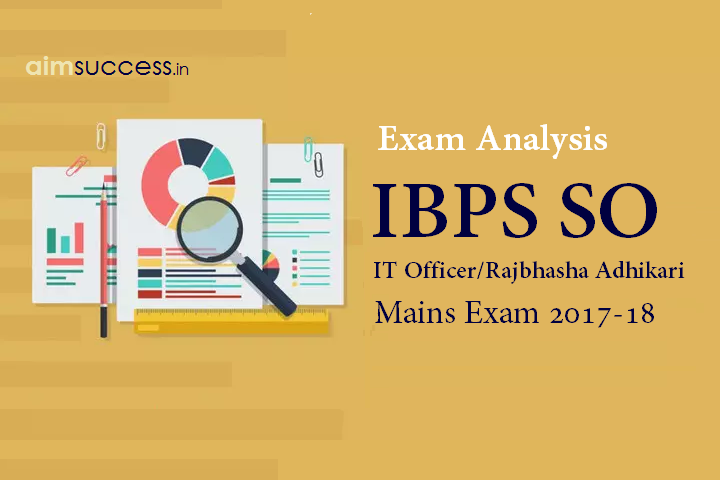 Much to student's relief, the questions asked in this years IBPS SO Professional Knowledge Exam for IT Officer candidates was of an Easy-Moderate Level. This year major proportion of questions were from C++ and Object Oriented Programming Concepts (OOP). The questions from OOPS were however of basic to a moderate level. There were No questions about OOPS Programming or Error Detection of code or finding output. Along with OOPS there was a good ratio of questions from Networking, Data Structure and DBMS as well. The level of IBPS SO Mains Exam of Rajbhasha Adhikari was also Easy-Moderate. But many candidates faced some issue with the font available for Hindi Language Typing in the exam. English to Hindi translation – 5 Qs. Hindi to English translation – 5 Qs. Hindi Translation of English Words – 5 Qs. The level of Descriptive paper was also Easy-Moderate. Two Passages were given to translate for the descriptive test of Professional Knowledge. The length ob both passages were about 200-250 words. A passage related to Job Opportunities was given in Hindi Language and candidates had to translate it to English. What is the highest allowable level of ‘Calcium’ in Manure? What is the highest K2O5 consumption? Ranikhet hill station is located in which Indian state? ‘Karan Fries’ is a new breed of? One question on Integrated Agricultural Marketing. What is the interest rate on Kisan Credit Card? One question on Kharif crops. One question on Power Tiller est. What is the minimum space required for a pregnant cow? One question on Small Calve Feeding. How many number of broilers rear are required in a batch? Percentage of Protein in the feed of fish. What is the Relative Humidity for crop production? What is Commercial Premium Funding? Which boat is used in Chilika Lake? How much time does prawn rearing take? Which of the following is a Salinity Tolerant Crop? What is the pH of Banana? What is the pH of Guava? What is the pH of Grape? What is the most salt degradable land state? One question on rainfall in humid area. What are the disadvantage of a four stroke engine? One question on tractor 3030-35. One question on Power Sprayer. One question on High Volume Spray. Which was the highest crop production area in 2015 -16? Which nutrients are required for Chlorophyll Formation and Cell Elongation? One question on Catalyst and Activator Nutrients. What is the importance of Micro Nutrients (Fe). One question on Perennial crop. What is the lowest width of disc plough? Which nutrients cause Tip Chlorosis and later leaf convert into black gelatinous matter? What is the Electrical conductivity of Saline Soil? What is the Exchangeable Sodium Percentage of Saline Soil? What is the pH of Alkaline soil? Totapuri is a variety of? Ratna is a variety of? Which Indian is the majorly involved in Shrimp Farming? Plywood Timber is mainly cultivated in which state of India? One question on Drip Irrigation Efficiency. These are the different topics which were asked in IBPS SO Mains on 28th January 2018.